I mentioned yesterday that I'm shopping for harddrives. The current external harddrive that I have is an older 120GB model that cost me about $110 in Nov. 2005. Today I'm looking at 1-2 TB models that run $70 or $80 range. If I remember right around 15-18 years ago I spent something like $200 or $300 for a 300 MB harddrive. The price of harddrives drops like a rock over time. 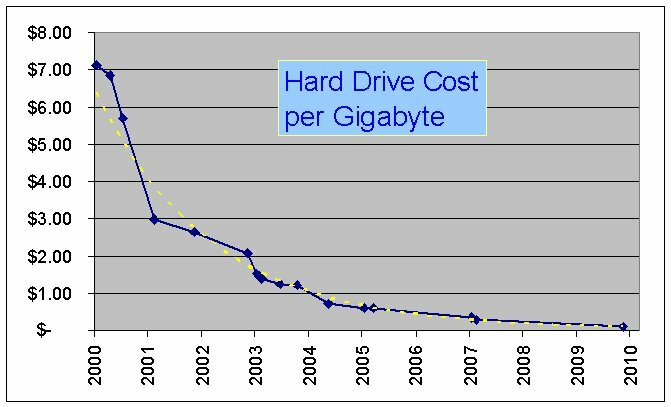 This nice article Cost of Hard Drive Space compiles a lot of data on the history of harddrive costs over the years. Here's a few data points to illustrate the history of hard drive costs over the decades. 1985 : 10 megabytes cost $710. Today 10 megabytes of storage is nothing. Today you can get blank DVD discs in bulk for as cheap as 18¢ and those are over 4GB. So today that 10MB of space is 0.045¢. 1995 : 1 GB cost $849. Ten years later you could get about 100 times the capacity for about 20% more. Yet today that 1GB would easily fit on a 18¢ DVD with 3GB to spare. 2005 : 200 GB for $100. Another 10 years later and you could get 200 times as much storage for almost 10% the cost. 2011 : Today you can pretty easily find a 1 TB drive for $50 range. In 6 years the cost has dropped in half and you get five times as much. I took some of the data points from the Cost of Hard Drive Space page and plotted a chart. I'm showing just the costs over the 2000 to 2010 period. The yellow dotted line is the trend line. In October 2000 you could get a drive for about $7.14 per GB. By August 2010 the cost had dropped to just 8¢ per GB. Over that time period thats a compound rate of -36% annually. 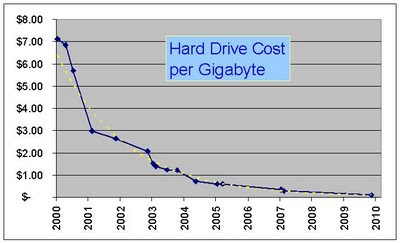 In general over the past decade hard drive costs have dropped approximately 36% each year on average.